What could be better than combining an ice cream sandwich with a doughnut – combining the classic Maxibon ice cream sandwich with Krispy Kreme’s Original Glazed doughnut! The master of doughnuts, Krispy Kreme, has joined forces with Peters Ice Cream for its newest creation – the Maxibon Doughnut. Filled with a blend of vanilla crème and chocolate chips, the Maxibon Doughnut has been hand dipped in smooth chocolate icing and topped with hazelnuts and a Maxibon biscuit. The soon-to-be-sought-after doughnut will be available at Krispy Kreme stores in NSW, WA, Queensland and Victoria, as well as online and at 7-Eleven stores until August 27, or while stocks last. “Now there is more than one way to have your MAXIBON!” Krispy Kreme announced in a statement. And there’s more! The Maxibon doughnut is not the only thing you’ll find in store. 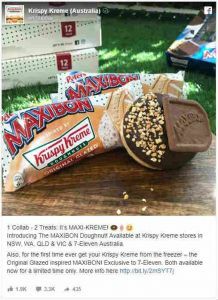 For the first time ever, you can now also get your Krispy Kreme from the freezer, with Maxibon Ice Cream exclusive to 7-Eleven. 7-Eleven first introduced fresh Krispy Kreme doughnuts in stores back in January 2012, with a steady stream of limited edition flavours introduced to entice Aussies over the years. The exclusive ranges are typically available for just a month, but Krispy Kreme Reese’s Peanut Butter Doughnut has seen an annual comeback by popular demand! Perhaps the Original Glazed inspired Maxibon Doughnut might also make its way back next year. 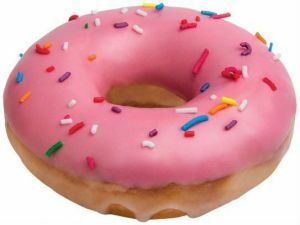 Another recent release from Krispy Kreme has been inspired by The Simpsons, and it might just leave you saying ‘D’oh!’ every time you buy it, given that it packs in a whopping 1,090 kilojoules per serve! The signature Original Glazed doughnut is hand dipped in white chocolate truffle with strawberry flavour and has a smattering of rainbow sprinkles.